November 24, 2015 by Palmer Keen in New, . Necessity, as the old cliche goes, is the mother of invention. I would argue, however, that there's another key ingredient, equally important and often abundant, that leads to new creations: free time. In my forays across Indonesia, I've begun to lose track of how many musical instruments had their genesis from the sheer abundance of free time in the agricultural lifestyle, the hours spent in bamboo huts by the rice paddies and vegetable gardens, guarding the crops from pests or just avoiding the heat of the midday sun. From the gondolio of Banyumas to the kenthulitan of Banyuwangi or the gongga lawe of West Sulawesi, countless simple folk instruments have sprung from this need to fill time. So let's take a moment to appreciate the unhurried pace of farming life: without it, countless treasures of human expression would never have been created or played. Take, for example, the cungklik. 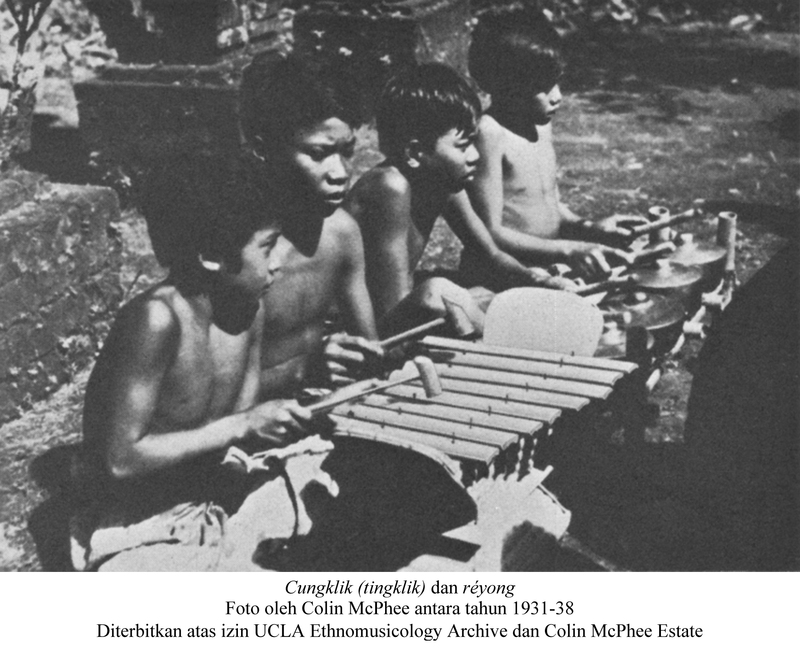 This xylophone, played only in Lombok, was born from the fields. As the old folks of East Lombok tell it, the cungklik came from farmers working with the materials at hand to create a new diversion. In this case, special wood called serengulu was chosen from trees which had been chopped down to make room for new rice fields. With abundant wood and equally abundant time, the cungklik was constructed and placed in the rumah kebon or field house, a kind of paddy-side hangout hut where farmers whiled away the hours guarding the crops. In these huts, the farmers crafted simplified renditions of the gamelan tunes they knew so well. I should note that there's a good deal of confusion about this instrument, mostly stemming from its name and the fact that it's almost wholly undocumented. An instrument called cungklik has been found to the west in Bali since at least the early decades of the 20th century - it was documented by early ethnomusicologist Colin McPhee in the 1930s. However, that instrument had tuned bars made from thin bamboo slats, not wood (some cungkliks in Lombok are made very similarly, but not the one I'm sharing here.) That instrument, it seems, morphed into the popular bamboo xylophone that is now most often called rindik, although some call it tingklik, and just to make things extra confusing, some still call it by the old-fashioned name cungklik. To my untrained ear, the Sasak cungklik seems to be a kind of long-lost brother of the modern Balinese rindik/tingklik/cungklik. In construction, they are quite different - rindiks have around thirteen keys made from whole bamboo tubes which act as their own resonator (nearly identical to the angklung paglak I recorded in Banyuwangi, East Java) while the cungklik I recorded had eighteen wooden keys resting on a wooden trough resonator. Further differences spring up: the rindik exclusively uses the salendro scale while the cungklik in this recording uses the pelog scale so ubiquitous in Lombok. The playing technique is uncannily similar, with two hands playing rippling rhythms in unison an octave apart except for occasional little flourishy variations between the hands. This is what sets the cungklik apart from the gambang, a nearly identical xylophone usually found in gamelan ensembles in Java - while looking just like a cungklik, the gambang plays more elaborate, rhythmically free parts and is almost never a solo instrument. This confusing parade of instruments may only be of interest to tuned percussion nerds like me, but I think it points to something easily appreciable. This handful of islands has such a profusion of instruments, with such a variety of materials and playing styles, that even now, after more than a hundred years of meddling ethnomusicologists, there still remain instruments that have been left unexamined, if only by outsiders like myself. My only hope is that humble instruments like this, born of free time and rural ingenuity, be appreciated anew, not only by Western music nerds but by Sasaks as well, folks who should find great pride in the plurality of expression they've crafted on their beautiful little island. Two years ago, I'd found something in Lombok that evoked an insatiable curiosity in me: a lonely instrument with no one around to play it. I was in Sembalun, an area in the misty foothills of the great Rinjani volcano. Upon hearing of my interest in local sounds, a worker at my homestay had led me to a nearby field, telling me proudly of an instrument he called klentang (confusingly, also the name for an entirely different gamelan ensemble found in Lombok.) It was still played by farmers to this day, he told me, but upon taking me to the field on a rainy morning, we found that the farmers had gone home due to the weather, leaving this enigmatic klentang abandoned and unplayed. I could tap away on the instrument myself as much as I liked, but the music eluded me. On my next trip to Lombok, I described this experience to my friend Erwin, a local tour guide and walking Sasak music encyclopedia, and he immediately said, "Ah yes, cungklik." Are you sure? I said. They told me it was klentang. He explained how names and materials varied around the island, but they were all essentially one family. There was a wooden cungklik nearby - would I like to hear it? You can only guess my answer - I think I may have jumped out of my chair! We hopped on our motorbikes and we drove to an area called Masbagik, famous for handcrafted pottery. Erwin pulled us up to a cluster of houses where he seemed to know everyone - being a tour guide who consistently brought foreign tourists around East Lombok, he was well-known and respected throughout the island. This was helpful to me, I found, as within minutes we were in an empty room and a man was plopping the cungklik on the concrete floor. I was expecting an instrument similar to that which I'd seen in Sembalun, which was almost toylike in scale and construction. This, however, was a different beast, a full-size xylophone with thick wooden keys, blocky and unpolished in a beautifully utilitarian kind of way. Simple wooden hammers were used to beat the keys, bringing forth a surprisingly resonant tone, far more full than the clickity-clackity klentang or the similar kenthulitan I'd recorded in Banyuwangi. A small gaggle of kids gathered round as a man (whose name, embarrassingly, I did not record) sat down behind it and played a charming, rippling tune, gamelan-like in its cyclical melody and form. Erwin seemed as charmed as I was as, after a brief negotation in the local language, he picked it up and brought it outside, tying it to his motorbike. "I'm taking it home for myself!" he said. What about the musicians here? I asked. What will they play? "They'll make another one," he replied. "They've got plenty of time." Terima kasih banyak Pak Erwin, tanpa anda proyek ini di Lombok tidak mungkin sama sekali.